The EM1206 has three connectors: main connector, additional connector, and magnetics connector. 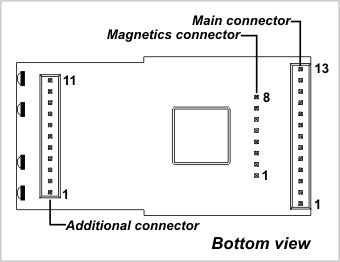 Depending on the EM1206 version, magnetics connector can be soldered facing up or down, as described in the Mechanical Dimensions topic. Backup power for the real-time counter. Do not connect to 3.3V directly! General-purpose I/O line 8 (P1.0). General-purpose I/O line 9 (P1.1). General-purpose I/O line 10 (P1.2). General-purpose I/O line 11 (P1.3). General-purpose I/O line 12 (P1.4). General-purpose I/O line 13 (P1.5). General-purpose I/O line 14 (P1.6). General-purpose I/O line 15 (P1.7). 2.This line can be assigned to serve as an RTS/Wout/cout line of a serial port. "Clean" 1.8V power output for magnetics circuitry.